The application to apply to the College of Textiles Summer Textile Exploration Program (STEP) is open for high school juniors going into their senior year. 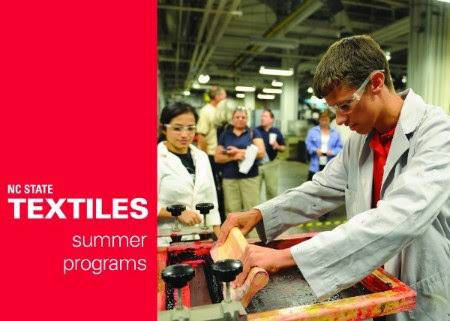 The College of Textiles holds four one-week sessions of STEP each summer. Participants live on-campus, learn about our degree programs, the admissions process, scholarship opportunities and work on a project related to one of our majors. The program cost is $250 for each participant; limited financial aid is available. To learn more about STEP please visit our website. If you have questions, please contact Shannon Tart - sdtart2@ncsu.edu. The College of Textiles also offers a two-day workshop, Polymer Camp, for high school juniors interested in physical sciences, engineering and attending NC State. This is a great opportunity to learn more about our Polymer Color Chemistry, Textile Engineering or Textile Technology degree programs. To learn more about Polymer Camp please visit our website. If you have questions, please contact Lakisha Patterson: lypatter@ncsu.edu.